The occasional brief ramblings made by myself, Ed Delgado, host of the Late Night with Mr. Ed podcast, while I am on the road on any given moment. The Caramel Conservative Podcast is a no holds barred, no B.S. take on the current events and politics in the United States with a great mixture of sarcasm and humor from a very right of center perspective tempered with common sense. In other words, it's "Real Talk By Real People". 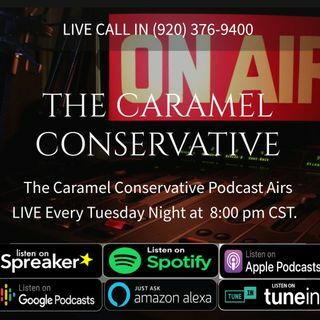 The Caramel Conservative Podcast airs ... See More LIVE every Tuesday night at 8:00 pm CST where we talk about the latest current events with myself, Just Jen, and some unexpected guests. Your calls are always welcome at 920-376-9400 during the show. FYI: The Caramel Conservative Podcast is NSFW. The Tree of Liberty: Lessons In America's Historic Documents is an extension of The Caramel Conservative Podcast with the intent of growing in our understanding in the very documents and ideas that helped shape the United States of America. Here we will examine the most important documents that have helped to create and form the ... See More United States of America as it was meant to be taught. Through readings of such documents as The Declaration of Independence, The Articles of Confederation, The U.S. Constitution, The Federalist Papers and more we will seek to get a greater understanding of the minds that helped form and keep our country together and with any degree of luck gain a better understanding so as to apply these lessons to today's body politic. Always informative and hopefully entertaining we hope you'll engage in the show and share what you learn.